The Ob Hill Up Hill course. 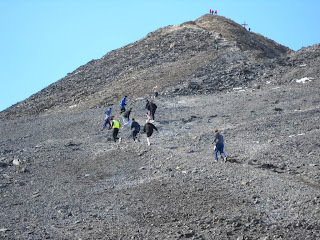 Every year, people climb Observation Hill. Some people make it a personal goal to climb it every day to stay in shape and to remind themselves just how beautiful this place is. It really only takes 30-45 minutes to go up and down if you are moving well. However, that just isn't fast enough for some of us. Once a year in December, we race up it. On the road up, I was in 9th place (back of this picture, leader not shown). The Ob Hill Up Hill race is always the least attended race and that is probably a good thing. The footing is loose. There isn't much room to pass. You are allowed to go off the trail, but then you are climbing up very loose scree. I hadn't been training because I had hurt myself so I, once again, didn't think I'd do well. For those of you who have been reading this blog long enough, that means I am likely to do have done well. Whenever I think I am going to do well is when I do badly. Anyway, I got to the base of trail in ninth place, even lower than I expected. Two-fifths up, I move into 5th. 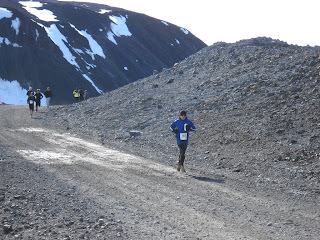 During my first Ob Hill race, people went out to fast and I was able to pick them off. I also had to walk because I went too fast in some sections. My goal this time was to not walk at all and just finish as well as I could. When I got to the trail part of the race this year, I didn't think I'd stay in 9th because a lot of people went out pretty fast. By the halfway point, I was able to move up to third by cutting switch backs. Shortly after, second bonked and I was able to pass him. I didn't think I'd catch first, but they started to walk and I closed in. 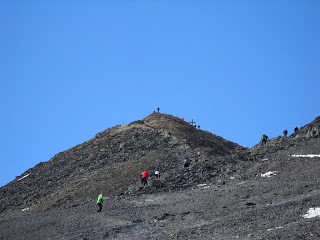 At the top, they chose the longer route which allowed me to close quickly. Unfortunately, I didn't quite get it done. I took second and was happy with it. I didn't walk and beat my past time by 40 seconds. I was also excited because my dorm did really well. For the men, HoCal placed 1st, 2nd, and 4th. For the women, we finished 2nd. I think we could dominate dorm Olympics. You can only see my head in 2nd here. congrats on 9th place. it's not about the destination as it is about the journey -- or so i am told, but screw that, i hope the destination was freakin' awesome! Welcome back. Will you be starting to write again soon?